Chatbots: Sephora’s Not Just A Pretty Digital Face – It’s Very Smart, Too! Markets are conversations. Trade routes pave the storylines. Across the millennia in between, the human voice is the music we have always listened for, and still best understand. In 2014, Sephora, a world leader in beauty retail, joined the 6 percent of brands on SnapChat, blasting their followers with special deals on new beauty products. In 2015, the beauty powerhouse teamed up with women’s lifestyle publisher, POPSUGAR, to do what no makeup brand had done before: attach a mobile shopping function to customers viewing fleeting photos in Emoticode, an app similar to Snapchat. A year later, on June 6, 2017, Sephora’s Senior VP of Digital Marketing, Mary Beth Laughton, gave the keynote address at the same Internet Retailer Excellence Awards. Laughton offered insights as to how Sephora, by partnering first with Kik Messenger in Spring 2016, and then Facebook Messenger six months later, introduced its chatbot messaging apps to leverage the power of smartphone mobile by delivering an immersive retail experience that goes beyond mobile commerce and empowers shoppers to learn, be inspired and play through the power of chat. Why the move to chatbots? According to Brian Honigman, a content marketing consultant and the CEO of Honigman Media, a consultancy focused on helping marketers and entrepreneurs see results with content marketing and social media, chatbot apps are mobile’s sleeping giant because they also embrace the power of platforms. That is why the original iPhone succeeded. It was not based on product alone but also leveraged the power of the app-store ecosystem. Messaging apps provide the perfect ecosystem for the next generation of applications. It only makes sense that a chatbot, whose ancestor was exclusively used for communication, and which was dubbed by Steve Jobs in the iPhone keynote as an “internet communicator,” would manifest the fundamental human need to connect and communicate. The Waterloo, Ontario-based company, Kik Interactive, which makes Kik Messenger, announced the launch of Bot Shop in April, 2016, and by doing so, made Sephora the first beauty brand to debut on Kik’s chatbot messaging app. In Kik founder and CEO Ted Livingston’s words: “Chat is going to be the next great operating system. Apps will come to be thought of as the new browsers; bots will be the new websites. This is the beginning of a new internet”. Livingston promotes chatbots as the future over conventional apps because of chatbots’ ease and speed of use. There is no new app to download, no new account to create, and, perhaps most importantly, no new user-interface to learn. The customer just scans and chats – on a frictionless and almost instantaneous platform. For millennials and teens around the world, messaging apps like Kik have increasingly become preferred mediums of communication. About 42 percent of Kik’s 275 million-strong user-base is aged 18 to 24, according to ComScore. Its core market is Generation Z, or younger millennials, who do indeed feel at home with such chat interactions. Sephora’s goal: convert them into paying customers, too. According to a Forrester Research study that analyzed 2,000 US smartphone owners to determine how users engage with the apps they have on their smart phones, the findings suggest that in 2014, smartphone users had an average of 26 apps on their phone, but that dropped to an average of just under 19 apps in 2015. More recent research has the number of apps down to just 5. Modern messaging apps, by their nature, are used as not simply a means of sending messages but of maintaining a conversation. That means a nearly constant loop of notifications, checking one’s phone, and responding, all the while maintaining a relevance that no other type of app notification can match. These notifications, when implemented correctly, are constantly being opted into by the user. Chatbot is able to go far beyond mere text, and can incorporate voice, video, and a whole host of entirely programmable interactive message elements. Chatbots are a different kind of social and what works on Facebook or Instagram isn’t going to work in a bot, and that’s due, in large part, to the intimate nature of chat. When one thinks about their own messaging habits, on iMessage or in other apps, who are we talking to? It’s almost certainly a thoughtful list of close friends, colleagues and family. The same is true for those using chat apps to communicate, and now, with chatbots, brands can be a part of that exclusive contact list. Because the user must choose to have a brand on her list in order for it to be there, that communication’s capability is all the more meaningful. Rather than wait for content on their feed, customers are requesting to engage with customized brand content they want and need in the moment. On the flip side, a chatbot enables a brand to have a two-way exchange — with any user who invites one. Compare that to a conventional social setting: although brands and consumers can communicate one-on-one on platforms like Twitter and Facebook, two-way, personalized conversations are not possible or available for the user on-demand, 24-7. Chatbot in 2016 ushered in the year of conversational commerce, a new way in which content and the shopping experience converge. More than 1.6 billion people used a chat app in 2016 and collectively, more people are using the top four chat apps than the top four social media apps now. Chatbots aren’t what’s next. They’re here. With Sephora’s Kik chatbot, users could now have a one-to-one chat experience on mobile. If users wanted to learn about makeup via tips, video clips and picture tutorials, they could, instantly and seamlessly. Even better, the Kik chatbot could help customers find the products used in Sephora’s tutorials, and even could suggest top-rated products for any category. For in-store shopping, the Kik chatbot became the perfect shopping assistant. Type in any product, like “Nars Blush,” and the chatbot would instantly share the product reviews and ratings. Users would be able to not only get their beauty product reviews, recommendations and tips instantly, but also make purchases directly on the app. Where it used to be one could say, ” there’s an app for that”, soon, one will say, “there’s a bot for that”. Why Sephora’s strategic investment into chatbot messaging? Simply, Sephora is building a mobile optimization culture. Twenty-three percent of shoppers compare prices on mobile while standing in-store and before going to a bricks-and-mortar location. Additionally, 24 percent engage with a retail app each week, leaving a prime opportunity for Sephora to connect with loyal customers on mobile. In a speech in February, 2016, Retail’s Future Vision: Using Data To Innovate The Customer Experience (It’s All About Mobile, Social And In-Store), Angel Doran, Sephora’s Director, Product Analytics & Optimization, explained how inaccurate data has a direct impact on the bottom line of 88% of companies, with the average company losing 12% of its revenue to bad data. Sephora needs clean data to help create value-added personalized experiences. Chatbot goes a long way to help with that. Doran stated more accurate data has given Sephora a meaningful 4.4%-25% increase in conversions across platforms. Why liaise with Kik? Because, simply, it was there first with a chatbot. In an interview after introducing Kik chatbox, Sephora’s VP of digital marketing, Bindu Shah, said, “We’ve had our eye on what Kik is doing for a while now and strongly believe that it is a top app that offers Sephora a new avenue of connection with our clients… their brand engagement and client acquisition, particularly of the highly mobile and connected audience of Gen-Z and younger millennials, was a huge draw for us… with Kik, we’re able to leverage our extensive library of how-to content, videos, images, and text tips in a new way.” …“We know ratings and reviews are a very important and trusted part of her (the customer’s) decision-making journey — and now, she can use the Kik chatbot as a resource instantly, rather than waiting for relevant content to appear in a news feed,” said Shah. Shah’s boss, Mary Beth Laughton, Senior VP of digital marketing, elaborated, “We’re finding that once a Kik user starts a conversation with our Sephora bot, they’re engaging deeply, averaging 10 messages with our Sephora bot per day,” Targeted push notifications to those Kik users encourage them to view new content. Laughton says those notifications have a high open rate but declined to give a specific number. So how does Sephora’s chatbot work? Its interaction with customers on Kik is designed to resemble a regular conversation. Users just have to add Sephora on the platform and start chatting. The chatbot then provides a brief introduction, welcoming them and explaining that they can get makeup tips and reviews by chatting with Sephora. There’s the requisite amount of emojis sprinkled in, too. By creating a personalized experience for its customers through a small opening quiz on the app, the chatbot can use the results to serve the customers’ appropriate content and suggest products tailored to their individual tastes, while at the same time, enhancing Sephora’s data base about their users. Product recommendations are based on a range of questions about their age group, favourite makeup items, and brands and products they cannot live without. The end product is a piece of content based on their interests. Users can also search for product categories, read reviews of specific items and purchase them, all activities of which become housed on pages within Sephora’s data base. The brand also asks people what types of products they already use to help find out more about them via a pop-up keyboard that offers options. There is another smart data play here — the more Sephora knows about its customers, the better it can personalize recommendations and deepen brand loyalty. Sephora was the first to hold a sweepstakes on Kik. Being a first, both for Sephora and for Kik, they had no way of predicting the level of engagement they would get from it. Sephora was amazed at the level of engagement, which was significantly higher than standard contest metrics on social platforms. And, the sweepstakes enabled Sephora to collect actionable insight from users, all the while giving them a fun and rewarding experience. With the Kik chatbox, Sephora continued their drive to thrive on digital experimentation, looking to connect with clients in innovative and unexpected ways. “I don’t know anyone who likes calling a business. And no one wants to have to install a new app for every business or service that they interact with. We think you should be able to message a business, in the same way you would message a friend.” — Mark Zuckerberg at F8 developer conference in 2016. While chatbots are not new (SmarterChild was the friendly buddy that was popular on AOL Instant Messenger more than a decade ago), in early 2016, a lot of industry buzz was percolating that a grand chatbot was coming. On April 12, 2016, in his keynote address at its annual F8 developer conference, Facebook’s chief executive, Mark Zuckerberg, made it crystal-clear he believed people prefer to interact with AI via text in a messenger-friendly, audience-friendly way. Zuckerberg introduced the rise of chatbots on Facebook. It was opening up Messenger, its own messaging app, and any outside company — from Applebee’s to Zara — could create a chatbot capable of interacting with people through Messenger’s chat program. 1) 100% cloud-based, no downloads necessary; 2) high penetration rate – 64.5% of smartphone users have at least one chat app installed; 3) align content with context – chatbots know location and intent, allowing intelligent delivery of ideal content right when users need it most. With the move, Facebook aimed to usher in a new era of customer service by bringing together the 900 million regular monthly users of Messenger with the more than 15 million businesses that have an official brand page on Facebook. Sephora, quick to take advantage of the powerful new chatbot player, in early November, 2016, announced the launch of two new chatbot-powered beauty tools available exclusively on Facebook Messenger. One, called the “Sephora Reservation Assistant,” lets users use natural language processing to book makeover appointments. The other, called the “Sephora Virtual Artist”, lets users upload a selfie and virtually try on different lip colours. The current Facebook chatbot and the virtual artist on Sephora’s mobile app have received over four million visits, with over 90 million shades tried on. Clearly, Sephora clients love to engage with the virtual beauty try-on! 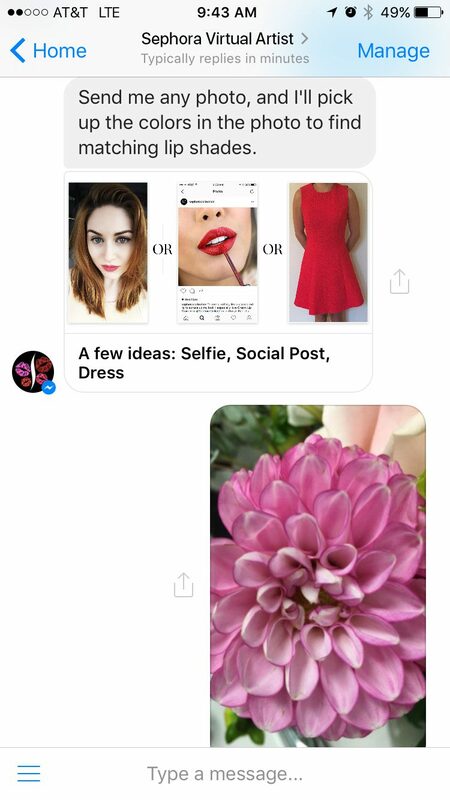 As the first beauty retailer to introduce the Kik chatbot earlier in the year, delivering contextual customer feedback and custom-curated content, Sephora’s chatbots’ launch with Messenger continued to pioneer Sephora’s fast, easy and fun mobile-first technologies that integrate beauty into their clients’ daily routine. There’s no “playbook” for chatbots just yet, but Sephora is hopeful that by experimenting, learning and iterating, they will continue to uncover more potential in chat, and Mary Beth Laughton’s keynote speech on June 6th, 2017, may just have inspired the rest of the industry while doing so. So, has Sephora blazed a path for chatbot messaging? Maybe. Since Facebook announced its decision to partner up with companies to create custom chatbots last April at its F8 event, businesses have quickly started to embrace the ultra-convenient way to communicate with customers. The decision to join a platform that already has nearly two billion active monthly users is likely not something that takes too much convincing, and messaging apps now surpass social media use. Chatbot start-ups are growing and licensing their technology to large brands is making it easier to develop a chatbot than ever before. Blake Morgan, in her recent article, June 8, 2017 How Chatbots Improve Customer Experience In Every Industry: An Infograph, catalogues the stats: 51% say a business needs to be available 24/7; about 46% would rather contact a business through messaging than email or phone; only 2% of financial institutions think chatbots are a threat; in education, AdmitHub showcases how chatbots can be used in a way students want to consume it; Wells Fargo is testing a chatbot on Facebook Messenger: customers can ask where the nearest ATM is, for example; with 70% of customers buying insurance on their phone these days, chatbots meet the great demand for quick service; H&M uses its Kik chatbot as a personal stylist; a chatbot puts a travel agent in every user’s pocket and makes the planning process much easier; telemedicine is growing and as busy patients demand new ways to communicate with doctors, using chatbots helps to eliminate increasing healthcare costs while providing an improved customer experience. Business-to-business (B2B) bots are proving especially attractive to investors, more so than consumer-facing bots. Recent figures indicate that 180 bot-related companies have attracted $24 billion in funding to date. Although consumer-facing chatbots, like those found on Facebook Messenger and Kik, have received the bulk of media attention, businesses like banks, insurance companies, well-known brands such as CNN or KLM, to name a few, appear to see more initial value in chatbots targeting B2B interactions — such as an HR bot that can quickly retrieve internal data requests. Take a minute here to meet “Amelia”. Chatbots have the potential to help businesses significantly cut labour costs. While complete automation of the customer service workforce is not feasible — and in many cases, ineffective — automating customer management and sales positions in the US where possible through chatbots and other automation technologies could result in considerable savings. Prove your business works over time with metrics: active users (monthly and daily), session length, retention (30–60–90), how monetizable is your demographic, and quality of user engagement. Investors want to see rapid and consistent growth. Identify clear end-goals and KPIs that your bot will accomplish when it interacts with users. Choose the right platform. Meet your users where they are. Define the purpose of your bot and where it needs to live to be the most effective. Choose a particular platform because it’s the best place to meet the users at their pain and solve what it is they’re trying to do. Bots must provide utility, not just surprise and delight. The ability of a chatbot to surprise and delight can drive long-term utility and better experiences for users. However, enterprise bots still need to answer why the ROI of chatbots is better than that of another interface. The ability to answer this question drives more discipline into how you think about what you’re building and why you’re building it. Enterprise bots have different strategies and goals. Investors look at the monetization of enterprise bots. VC’s know they will be transformative, and will have a great impact on the way in which enterprise serve their customers and customers will be happier because they can get their problems served more rapidly. Don’t just throw AI around. It needs to be executed thoughtfully. PS: and if you’re not in the chatbot space or thinking of entering it, and you just want to choose your next lipstick, don’t bother smearing the tester on your wrist, looking in the mirror with your wrist under your chin to see if the lipstick smear might look good on your lips, then tilting your head and asking your friend, “What do you think? Is it ok?” – just sign up to the “Sephora Virtual Artist” chatbot and ask it to pick the perfect shade!